He was born in El Guabo-Ecuador in 1994. Currently, he is an undergraduate student of Yachay Tech University. He is in the School of Mathematical and Computational Sciences on the major of Information Technology. 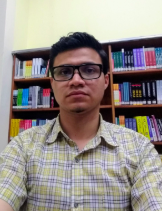 Moreover, he is developing his degree thesis, entitled "An exploratory study on the characterization and classification of electroencephalographic signals for the design of computer aided epilepsy diagnosis systems"